¬†¬†¬†¬† From the Jewish Talmud “Ethics of the Sages” . “Better be the tail of a lion,than the head of jackals”. (Head jackal of the whole pack versus one lion and you should prefer to be the lion’s tail). Just¬† ask Al Gore if he has thelast laugh. His former boss Billy Clinton isn’t even the head of jackals, maybe a hind leg at most! Even the very jackal who runs with you shoulder to shoulder, tongue out while you chase for dead carion would just as soon sink his fangs into your jugular vein if you falter once only! While the Royal “King of the Jungle” thinks, considers, takes his time and utilizes his strength and wisdom in the craft of bringing down his prey for the lion cubs, and the older lions.¬† His tail is attached to his body which is manuvered by the brain in his head, even all movements of¬†¬† his…..tail. ¬†¬†¬†¬† ¬† “Lion, king of beasts”.¬† One mature female or male lion has the whole forest in fear, in awe, it moves sagely,with grace and agility built mainly upon experience and knowlwdge of it’s strength. ¬†¬†¬†¬† So what is better to be a junior senator in the Illinois State Assembly, or the President of the gigantically large country of Libya?¬† (Check your map, it is a biiiiig country in North Africa). ¬†¬†¬†¬† ¬†When the Ruler of a large pack of jackals rants and digresses earlier at the U.N. he was just a buffoon on the world’s stage. ¬†¬†¬†¬† I won’t call this one immoral and a sponsor for terrorism while looking the other way at state terrorism on a monumental scale, no country or human is completely right¬† or moral.¬† It seems that “might makes right”. Even a large pack of jackals in number will be afraid to attack a virile, healthy lion, and if is a female lioness they had really be careful! ¬†¬†¬†¬† What is all this to do with” hookah”? ¬†¬†¬†¬† I was reading “Urban Dictionary” of slang that I’d seen many times online, but didn’t realize that members can edit or add words, definitions etc.¬†¬† Its a fantastic site with hundreds of thousands of slang words.¬†¬† When I saw how minute and detailed I checked out in their search engine for “hookah” also “narghila”. ¬†¬†¬†¬† 2 people only wrote very short definations of “hookah” and both basically stated that the hookah is used in modern countries to smoke un-mentionable substances.¬† For that their are so many types of hand crafted or manufactured bongs, chillums, pipes etc in the many thousands.¬†¬† They are small, cheap usually and fit¬† a pocket sizewise and money wise. ¬†¬†¬†¬† I only wish there were half the variety of hookahs made.¬† Was I going to¬† let them get away with this?¬† What if 18 year old Jeffrey tells his visiting Grandma that he’s going into his room “to smoke shish on my hookah”.¬† Well “shisha” she’ll think is hash shisha and “hookah”, “I’d better look that up” says Granny. Something only a person plainly misinformed would say hookah=drugs.¬†¬† Its a known fact that hemp variates like “Mary Jane” of Tijuana or hash have potent and drippy resins which leave residues and eventually in quick time ruin the metal inside of the hookah shaft, also ruin the hookah taste for good.¬† The most flavoursome shisha tobacco when smoked in your hookah after drugs will taste baad and a lot like metal. ¬†¬†¬†¬† This and that all the major hookah forums will kick you out for good if you mention drugs and hookah in the same sentence, page or during your lifetime. ¬†¬†¬†¬† So I had to be the “tail of a lion”. ¬†¬†To the “Urban Dictionary” she flies, and will understand that Jeffrey is a druggie??? “Hookah” is the Hindi-India word for “water-pipe”, used for smoking “shisha-tobacco” mainly all over the world today and is a gigantic online business. It spread from India to China,Persia all the Middle East and the Balkans. Today its universally found and can be bought to smoke at home, or smoked publically in a hookah-lounge where friends gather at tables can drink,eat and smoke. Obviously this goes to explain that the use of smoking Marijuana,hashish,etc in ahookah would not be done in a public hookah lounge. Its also a true fact that the said hemp products let out resin residues which ruin the metal shaft of the hookah after a certain ammount of smoking,besides making it smell and taste like M.J. instead of the very fragrant hookah tobaccos (shisha).Online can be bought more than 100 different shisha-tobacco company’s brand, each with 5,15, sometimes 60 or more flavours. The 2 Hookah styles are “Egyptian” more commonly found with a male head (the top of the metal smoking shaft portrudes and the ceramic or enamal bowl fitting on top is female, or “Syrian” with the top of the shaft a large hole and the ceramic tobacco bowl has a male portudence which fits the shaft. In Syria,Lebanon,Iraq and much of Iran the “Syrian style” is used while the rest of the world, Asia,North America,Russia,Australia,Europe,South America normally buy “Egyptian style” hookahs. ¬†¬†¬†¬† 3 main parts of the hookah: glass base (“Shisha” means glass in Old Persian) which is flat on the bottom and half or a bit more filled with water in which the smoke from the ceramic bowl (under hot coals) is sucked down the metal shaft and into the water where it cools and flows up the hose into the mouth where it is enjoyed either inhaled or not. ¬†¬†¬†¬† A gigant majority of the hookahs sold today on the Western market are made in China Mainland. Even in Turkey,Egypt,India, the North African countries, all who prided themselves formerly on handcrafted hookahs buy in the bulk of thousands from Mainland China and re-sell to tourists. Though of course there are the older hookahs mostly formerly made as objects of art. Czech and Bohemian glass makers blow hand crafted specially made and cut high grade chrystal hookah bases. 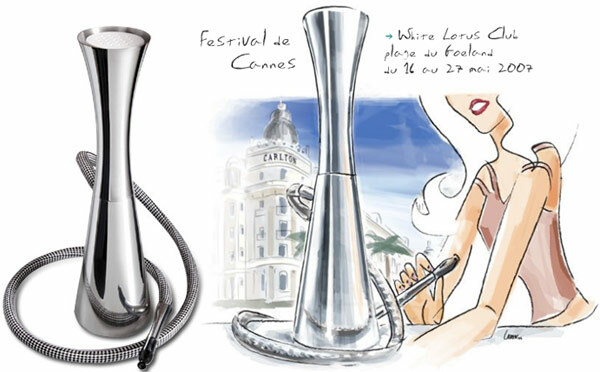 There are companies in China who make an over the shoulder aluminum walk-and smoke hookah and there is the company in Czechia which makes 5 amazing types of pure silver,gold or high intensity metal and jewel state-of-the-art totally modern scientifically engineered hookahs for the well to do. ¬†¬†¬†¬† There are 4 major hookah forums online each with 6,000-10,000 members the volumn of traffic amazing besides many smaller hookah forums. ¬†¬†¬†¬† “My dog loves the second-hand smoke when I smoke my “hookah”. He hears the hubbly-bubbly sounds and runs over for a long sniff.